In this day and age, the Internet is rapidly becoming the hub of marketing, and consumers are looking more to their computers to find commodities of life. For this reason, savvy business owners are turning to SEO companies for their advertising needs. One of the key issues in online marketing is staying at or near the top of the search engine result pages (SERPs) so customers do not have to scroll through pages and pages of competitor results. Business owners need someone with an insider’s look at how Google works; a professional to keep track of how often search engines update their ranking criteria. In the same way businesses need a tax preparer or an attorney, you need an SEO professional. Unless an individual is aware of all the Google ranking criteria, plus able to stay abreast of frequent algorhythm updates, they are going to need to rely on an SEO specialist. While business men and women are busy keeping their company running efficiently, the SEO expert can maintain the company website’s position at the top of the SERPs. Google ranks websites according to several key factors, and puts the best ranking websites at the top of the SERPs. The ranking criteria changes often, with 2012 having the most far-reaching and sweeping changes yet. Some of the changes this year have been in regard to the quality of content available on a website. Google has grown more intelligent over the years, and now, actually look for well-written articles as part of the ranking criteria. These are just a few of the highlighted ranking criteria changes. Unless you fully understand these and other SEO-related ranking criteria updates, your company will benefit more by having you doing the job at which you are best. 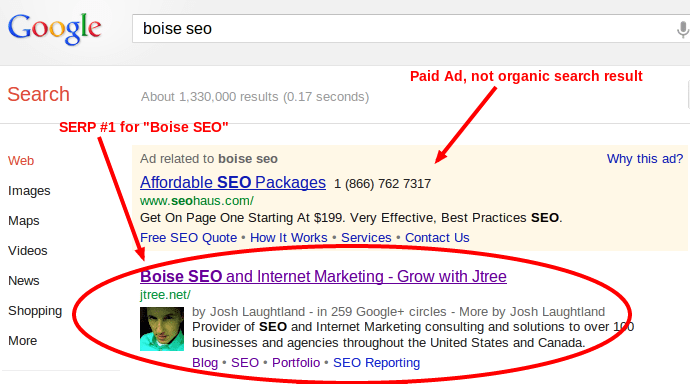 Leave SEO for the pros. The easy way is to find an SEO company whose website is at or near the top of their industry in a search of your locality. This will be a good indication that they know what they are doing, and that they can also keep your company at or near the top of the SERPs for your industry. When it comes to ranking, monitoring, and reporting, let the experts keep tabs on your keyphrase rankings. Call the friendly professionals at Jtree today, and let them do for you what they do best for themselves and others.